The artwork tells you everything you need to know. Imprints of black trees and a grey sea compound a sense of dread and regret with just a hint of white implying a sense of liberation just over the corner. For My Crimes, songwriter Marissa Nadler's latest for Sacred Bones, offers her own oil painting as an evocative album cover, a prelude to her 11 songs of painful realizations about love, loss, and the pain time and distance can inflict on relationships. 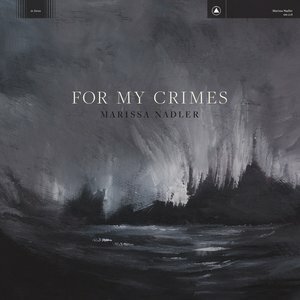 Her eighth album since her 2004 debut Ballads of Living and Dying, For My Crimes reflects the wonders of Nadler's world-weary songwriting and scratched angelic voice. Title track "For My Crimes" begs, "Please don't remember me / For my crimes", a sad, humble plea surrounded by a delicate acoustic guitar and woeful violins. If the song doesn't break your heart with its mournful lyrics, it will with its rich arranging and production value. "I Can't Listen to Gene Clark Anymore" is a complex slice of dream folk, amplifying themes of nostalgia and lost love with oceans of reverb and jangling guitars. Nadler's songs emanate a sadness tinged by a Southern gothic air. Her crooning coupled with moaning cellos and dirty guitars on tracks like "Blue Vapor" present a sense of misery and desolation. Despite being based in the Northeast, her music can best be described as "Nashville Noir", a meeting of Southern singer-songwriter traditions distilled through dream pop and rich studio arranging. "You're Only Harmless When You Sleep" is a hell of a title, and the track lives up to the hype with its heartbroken harmonizing and string background. "Dream Dream Big in the Sky" features more reverb-drenched vocals, signaling Nadler's spacious voice processing is more than just a passing production concept. It goes beyond the ethereal aesthetics of dream pop, recalling the spotlight treatment of famous past crooners. Processing her voice to make it sound like a distant cry isolated within a towering space emphasizes the loneliness on the album. The complex guitar work of "Interlocking" balances the texture and propels the track forward alongside Nadler's long, flowing vocal lines. Going beyond the voice-and-harmony-instrument obligations of a singer-songwriter, For My Crimes becomes a much richer, rewarding record because of its attention to detail and nuance. Undeniably so, sorrow and turmoil play the primary themes on For My Crimes. It's a beautiful record from start to stop, yet some listeners may resist being pummeled track by track with tales of existential heartbreak. Thin guitars and airy atmospherics permeate most of the album's 11 songs and, while they have a thematic purpose, they tend to feel tired towards the end. The simplicity of voice, acoustic guitar, and cello saves closing track "Said Goodbye to the Car" from feeling too distant, too static in relation to the rest of the album. As the sound decrescendos and Nadler breathes her way through the last chorus, you can almost hear her resolution, her acceptance, and peace with the tragedy of broken relationships. Songs about heartbreak are ubiquitous, so much so that they're considered a standard trope of the singer-songwriter set. For My Crimes subverts expectations by focusing on the music and its execution, not merely just the lyrics. Eight albums strong, Nadler knows precisely how to paint a picture with her music, and her latest shows exactly how complex that picture can be.